In some ways, the result of the first Gubernatorial Debate was predetermined. Even if nothing else had happened, the mere fact that State Senator Wendy Davis and Attorney General Greg Abbott met on the debate stage for this year’s Governor’s race was a clear win. A win for the state of Texas. In truth, that is the most important occurrence from the first Davis and Abbott contest. The candidates had very different goals for the evening. Davis played the role of underdog, going after her opponent’s policies, positions and former actions every chance she had. Abbott, on the other hand, tried to keep focused on his goal of running against President Obama more so than his actual Democratic opponent. Given these disparate objectives, it’s fair to say that both candidates achieved their desired outcomes. Davis landed a bunch of good one-liners that manage to question Abbott’s policies. Abbott was able to respond to Davis and then successfully pivot away from giving a more substantive answer. On style points, I thought Abbott did a better job, as Davis came off at times over-rehearsed and a bit distant. But that’s just mainly a personality preference, as other voters may have preferred Davis’ approach. Davis: Mr. Abbott, Judge Dietz has recently ruled against you and in favor of the schoolchildren of Texas, ruling that our schools are unconstitutionally under-funded. The only thing right now coming between our children and appropriate funding of our schools today is you. On behalf of the 5 million children of this state, will you agree that you will drop your appeals, and allow our schools to be appropriately funded? Did you catch the careful distinction there?? Abbott did NOT answer Davis’ question. He has the ability to drop the appeals, even if the 2011 law removed the ability for him to settle the lawsuits. Davis did not ask him settling anything. Abbott’s careful pivot here is key. To be fair, Abbott’s direct question to Davis was to ask if she regrets voting for Barack Obama. Davis simply avoided the question (in a less artful manner than Abbott) and spoke about why she is running for Governor. Those two exchanges get to the heart of how this debate went. Though Davis felt distant throughout, she did at least save her best points of audience connection for her closing remarks. Overall, my assessment is a slight win for Abbott, just because the situation felt more natural for him. But Davis met her objectives for the debate, and now has given her base, and all of Texas, a firm representation of what the Democratic party stands for. When performances are as close as these two candidates gave last night, the overall effect may simply come down to what sticks with the audience the most. Davis’ one-liners? Abbott’s demeanor?? Only time will tell. 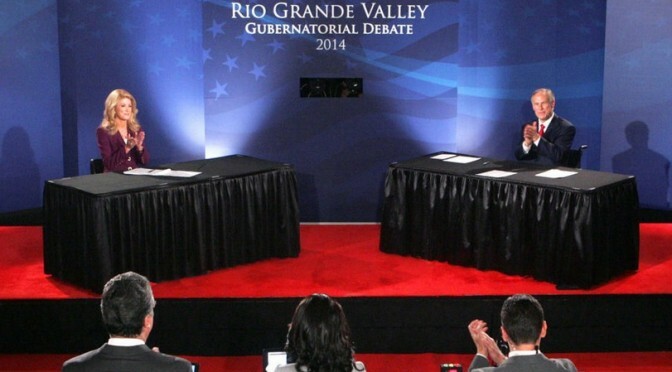 If you missed last night’s debate, here’s the full video from KGBT Action News. Check it out, and let me know your thoughts in the comments. It was carried on Channel 13.2, I tried to call them to find out what channel that was on Comcast digital, no one answered the phone, emailed and was told it was not carried by Comcast, it was on 315. I agree that Davis did a poor job and was very stiff.